This is "The Big Book of Yetis." 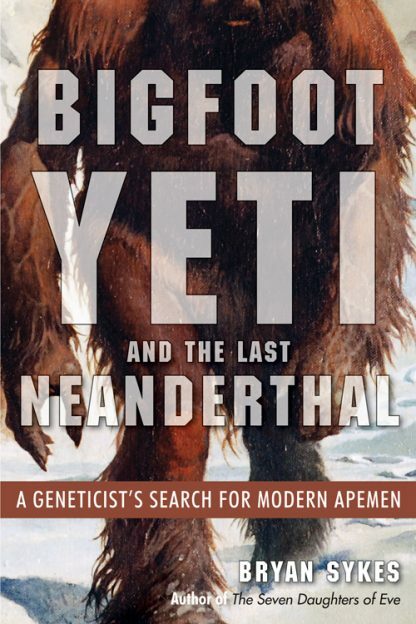 What the reader gets here is a world-class geneticist's search for evidence for the existence of Big Foot, yeti, or the abominable snowman. Along the way, he visits sites of alleged sightings of these strange creatures, attends meetings of cryptozoologists, recounts the stories of famous monster-hunting expeditions, and runs possible yeti DNA through his highly regarded lab in Oxford. Sykes introduces us to the crackpots, visionaries, and adventurers who have been involved in research into this possible scientific dead-end over the past 100 years. Sykes is a serious scientist who knows how to tell a story, and this is a credible and engaging account. Almost, but not quite human, the yeti and its counterparts from wild regions of the world, still exert a powerful atavistic influence on us. Is the yeti just a phantasm of our imagination or a survivor from our own savage ancestry? Or is it a real creature? This is the mystery that Bryan Sykes set out to unlock. Bryan Sykes is a Professor of Human Genetics at the University of Oxford and a Fellow of Wolfson College. He has been involved in a number of high-profile cases dealing with ancient DNA, including those of �Otzi the Iceman,� a well-preserved natural mummy of a man who lived around 3,300 BC and �Cheddar Man,� the remains of a man found in Cheddar Gorge, from approximately 7,150 BC. It is Britain's oldest complete human skeleton. Professor Sykes in best known outside the community of geneticists for his bestselling books on the investigation of human history and pre-history through studies of mitochondrial DNA.